We rent trucks, trailers, tow dollies, and have a full supply of rental products to fit your needs. 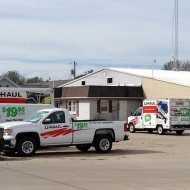 We're your U-Haul neighborhood dealer. All product prices and availability are subject to change without notice.